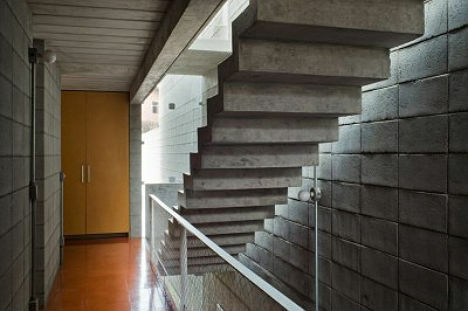 How do you make concrete stairs look lighter than air? 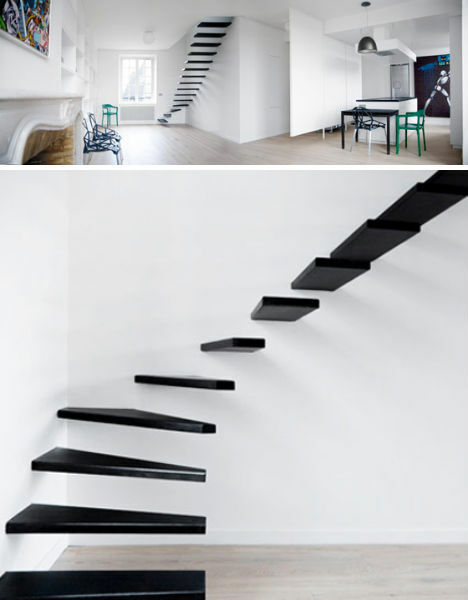 These stairs at the ‘Querosene House’ by architecture firm grupoSP seem to defy gravity, hovering with no visible support. 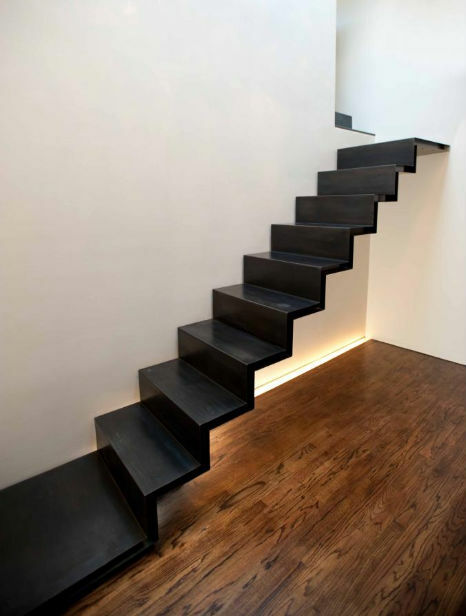 Floating from one floor to another, these black cold-rolled steel stairs resemble one solid piece of metal, folded like an accordion. 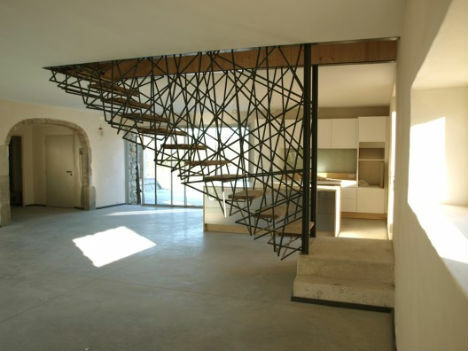 Designed by RAAD for a home in Manhattan, the stairs have several waterjet-cut steel stringers concealed within the thickness of the metal. 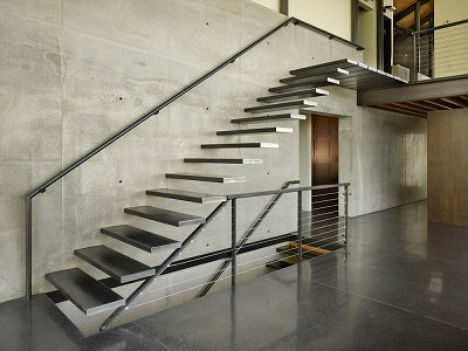 Cantilevered out from the wall, these minimalist steel stairs are right at home in a thoroughly modern West Seattle residence full of steel beams and exposed concrete. 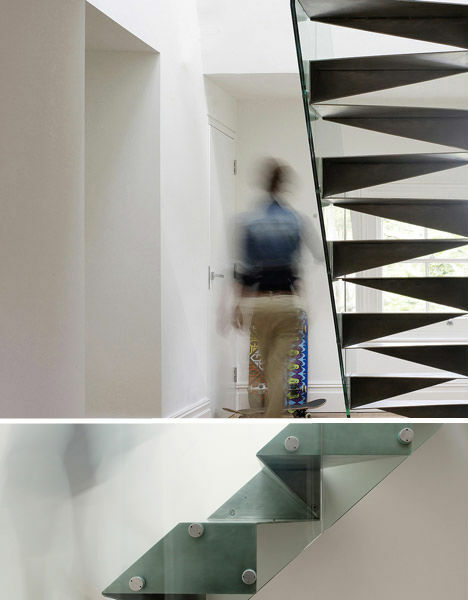 Folded like origami, this stainless steel staircase by architects Bell Phillips are a striking centerpiece for an all-white hallway in a London home. 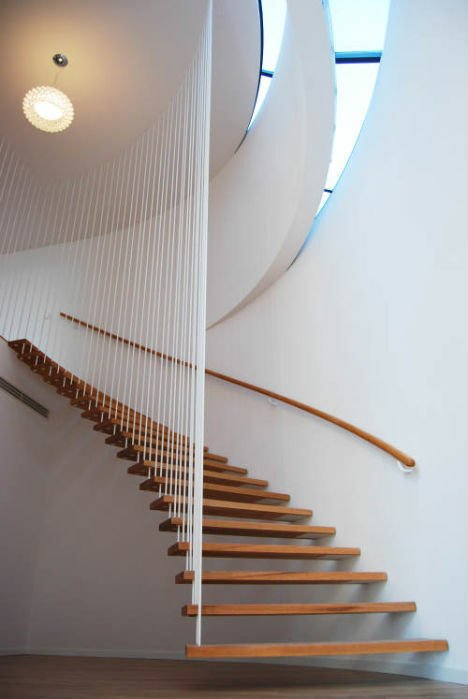 Six millimeters thick, the stairs look like they’re floating but are actually supported by a glass balustrade. 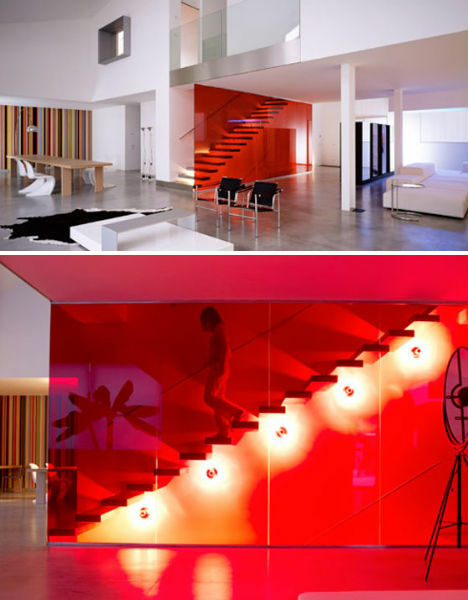 In the midst of an airy, mostly-white midcentury modern home is this seemingly floating staircase, supported on the external side by a sheet of red-tinted acrylic. 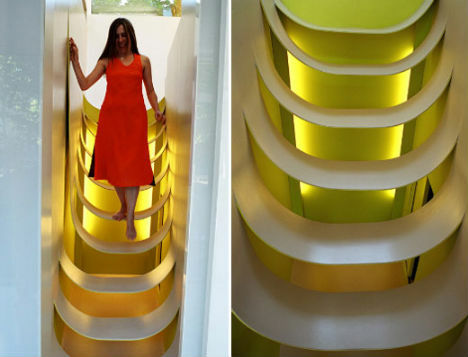 The stairs are lit from beneath and the transparent wall reflects the room around it, giving the whole staircase a slightly psychedelic feel. 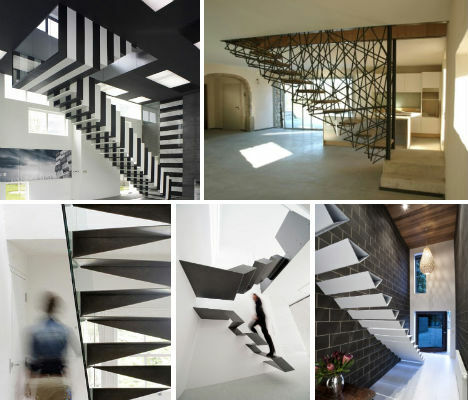 This whole incredibly creative space is definitely worth a look – it’s fascinating, fun and futuristic – but for the purposes of this article, let’s talk about these awesome stairs. Each curving step descends from the wall on either side, forming a totally unexpected way to access a play area on the next floor. 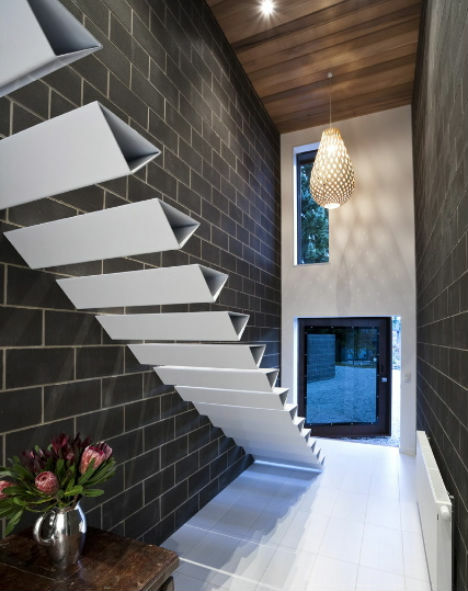 Triangular stair treads were a fitting choice for a very angular modern home in New Zealand, designed by architects Lat Forty Five. 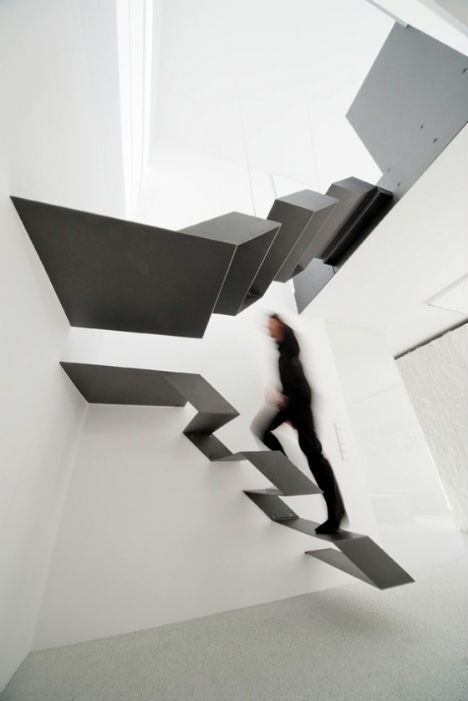 Each individual step is bolted onto the block wall to give the illusion of flotation. 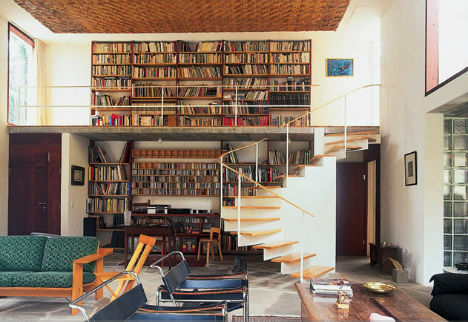 The owners of this home took full advantage of the ultra-high ceiling in the space to create a little library, connecting the second floor to the first with a partially spiraling staircase that is supported by a wedge of a wall, providing a private nook for reading behind it. 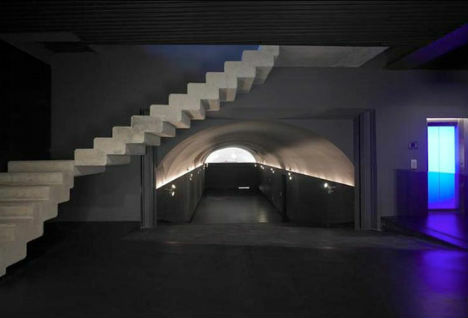 Concrete once again seems to flout the laws of physics in this unnamed building, photographed by Eugeni Pons. 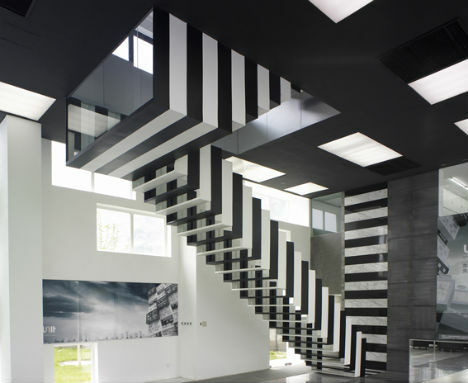 Two separate steps of ribbon stairs, hovering above the ground, form a breathtakingly artistic staircase at Büro.Loft in Austria. 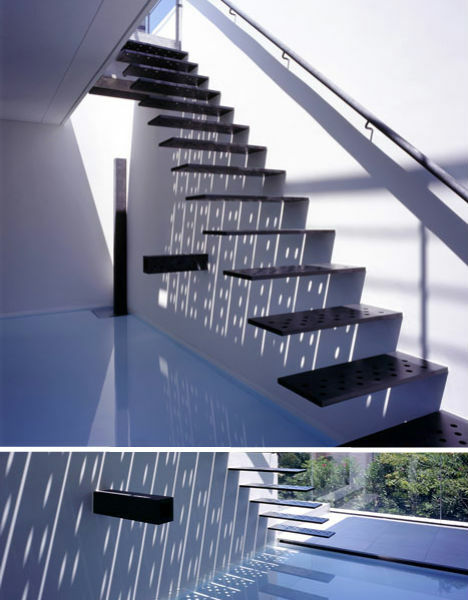 Achieving the opposite effect from the previous example, this staircase in Tokyo is as unobtrusive as possible, practically disappearing into the wall. 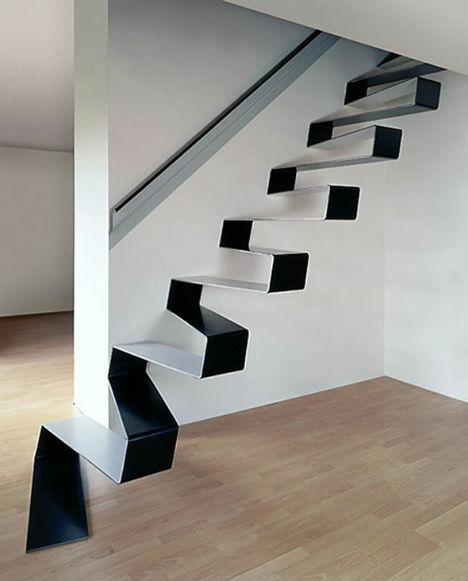 Viewed straight-on or from the side, this staircase by Eedesign doesn’t look too unusual. 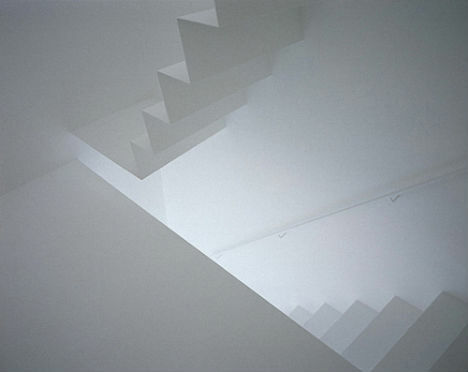 But from certain angles, the novelty of the design becomes apparent. 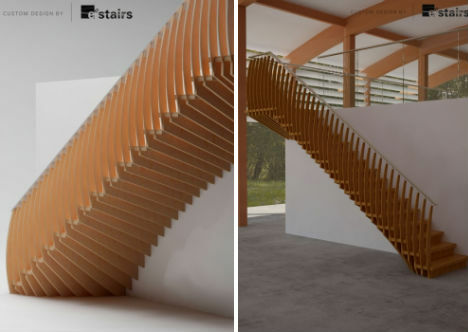 Beneath standard-shaped stair treads is a curving support system that resembles a spine, giving the staircase a highly sculptural quality.